ON A MONDAY OR WEDNESDAY MORNING. 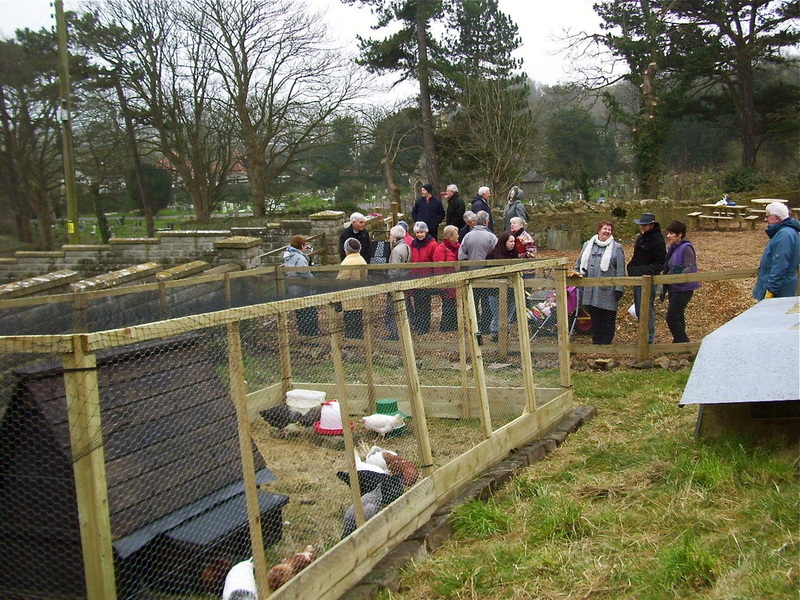 The Glebe is a patch of land on the hillside next to St Andrew’s Church. It is about 1.4 acres in size, and belongs to the Church of England. Its purpose in past centuries was to provide land for the vicar to grow food for his household, but it had not been used for a long time until in recent years it was rented out as a paddock for donkeys. The donkeys were supposed to help reduce and keep down the jungle of shrubs and weeds, but they did not really manage to do that, despite being much loved by many visitors to the church and churchyard. The donkeys did leave behind a large amount of excellent top dressing for all the new saplings that have been planted in The Glebe since the spring of 2012! Right now The Glebe is being turned by volunteers into a nature trail and park, open to all, not just the St Andrew's congregation. A pedestrian access gate has been installed, and all are welcome to walk the paths any time and see what is happening there now; things are progressing all the time. Some wooden picnic tables and other seating have been put up for anyone to come and enjoy the tranquillity and peace of this beautiful place close to "The Old Church". The latest addition (in February 2013) is a flock of 17 hens, complete with a coop and a fenced run. 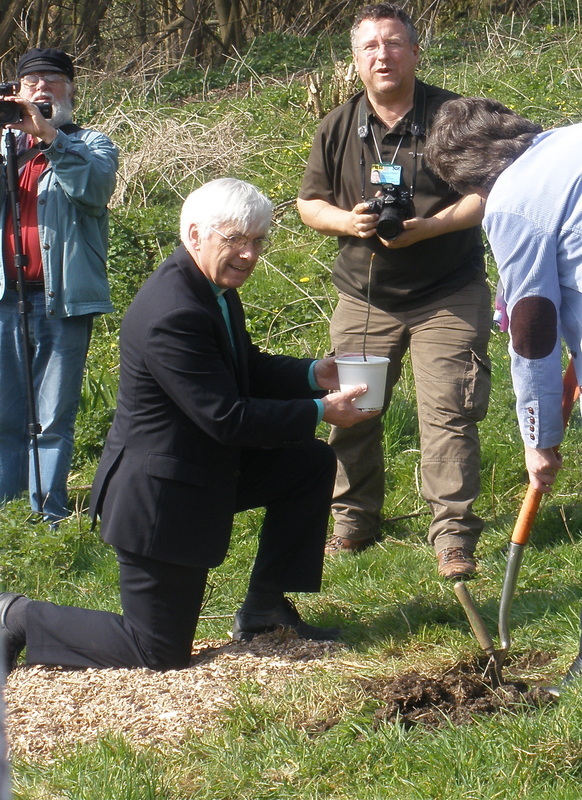 This new life for the Glebe began to take shape in 2011 when Eric Holdsworth, a member of the congregation at St Andrew's, inspired many others to help him with a major clearing and replanting project, with a view to creating something special to share with all the people of Clevedon. This project continues to go from strength to strength with lots of volunteer effort from both St. Andrew’s church members and the local community. 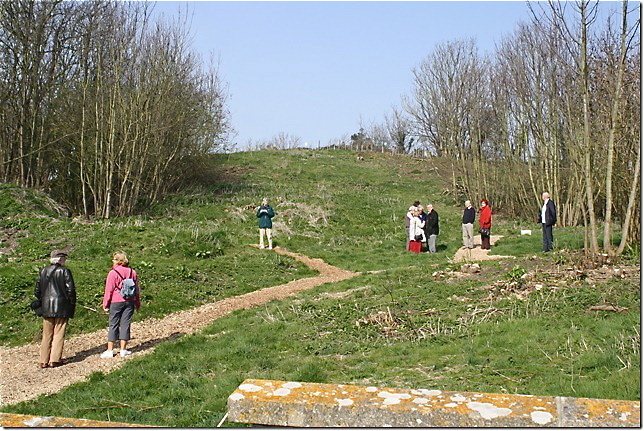 The thickets and dead and over-grown trees are being replaced with well-planned planting of trees, including cob, hazel and walnut to establish a “nuttery”, and saplings of oak, rowan, silver birch, hawthorn, hazel and blackthorn have been planted along the Poets Walk boundary as a wildlife hedge, after 420 saplings - complete with supports and protectors against rabbits and deer - were donated by The Woodland Trust to mark the Queen's Diamond Jubilee in 2012. Also a tiny Royal Oak sapling, especially sent over from one of the Queen’s estates in her jubilee year, was planted by Terry Baillie (who retired as our vicar in May 2012) and his wife Margaret. 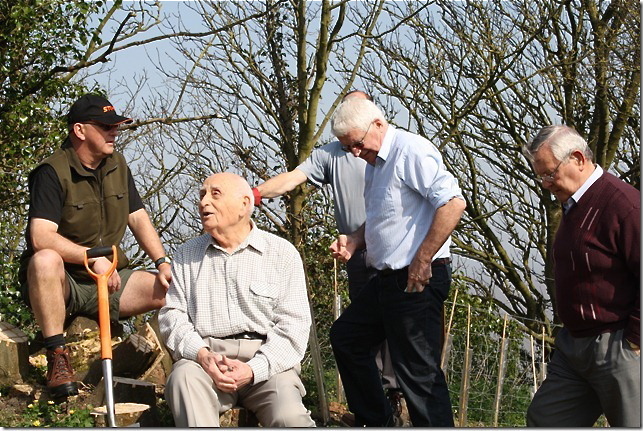 Money for the project has been raised in various ways, such as sale of logs; just one felled sycamore tree raised over £1300! There is a shed for use by volunteers to shelter from rain, to have a hot drink and to store non-valuable tools. 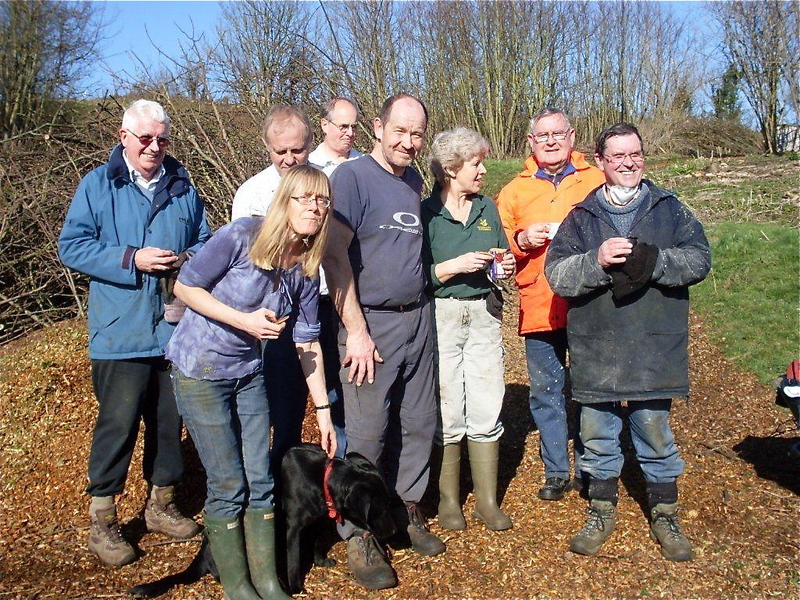 More volunteers are welcome to come and see how they might be able to help - simply turn up there on a Monday or Wednesday morning to find out! Unfortunately some of the work is being vandalised from time to time. Some saplings have been stolen, and others snipped off at the base. This is disheartening, but we won’t let anyone's thoughtlessness or criminal acts spoil things for the majority! If anyone does have any information, or spots any suspicious activity, please contact PC Dave Hughes at Clevedon Police station. The Glebe is a gift to be shared by all the people of Clevedon, provided with love by all at St Andrew's Church! Please scroll down for pictures of The Glebe. 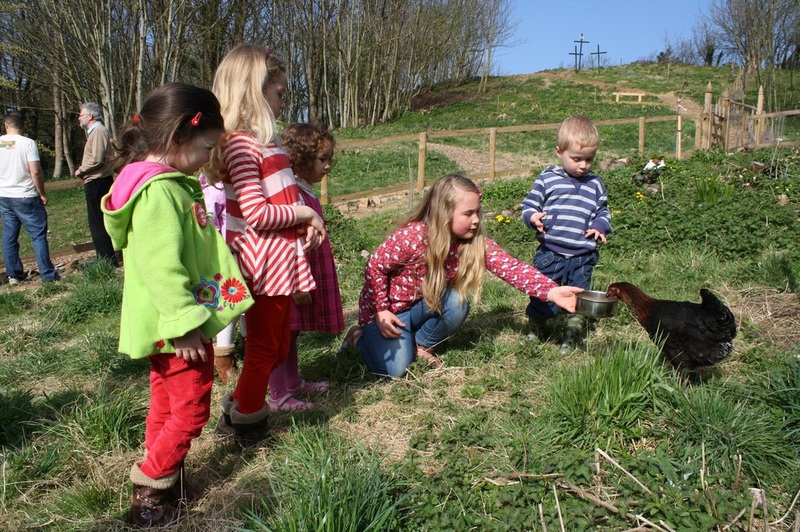 Feeding chickens at The Glebe, April 2013. The chickens are here now! Picture taken 20th February 2013. 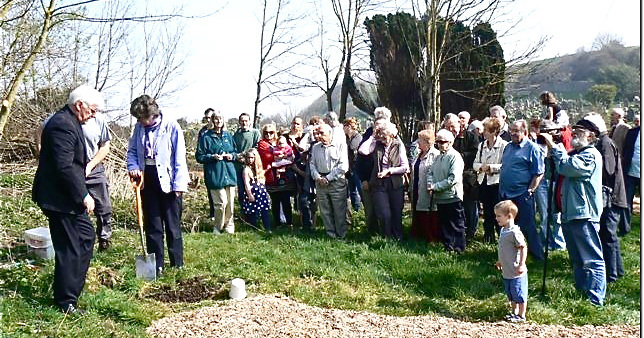 The planting of the Jubilee Oak sapling in 2012, by Terry and Margaret Baillie. 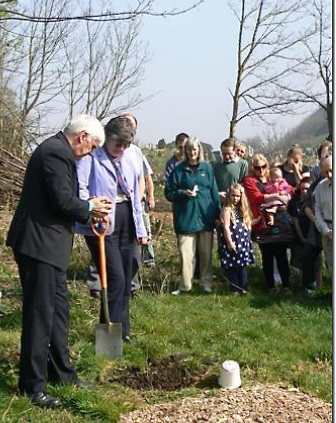 Terry and Margaret planting the Jubilee Oak sapling.